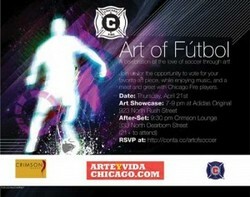 Artists show their love for the most popular sport in the world on Thursday April 21st at the Addidas store at 923 N Rush St. The collaboration between The Chicago Fire and Arte y Vida Chicago is something I have been looking forward to for months now. with the Champions League down to the Semi-Finals, all the European leagues coming down to the wire and MLS in full swing, this show couldn't come at a better time. A celebration of the strength, power and fanaticism of the worlds most popular sport through art is something to shout about. Apparently there will be Chciago Fire players in attendance, as well as voting for fan favorites and music. Everyone is also invited to an After Party at the Crimson Lounge to spend more time with the artists and players.